Detailing is a very serious cleaning job. There are two methods of detailing your precious car: You can get it done by a professional or you can do it yourself. Professionals do a good job, however, the other option is to do the job yourself. If you are considering the later, here’s a guide to doing it. Enjoy! If you are performing the detailing outside, avoid doing so in the direct sunlight. When the surfaces on a vehicle, such as the exterior paint or interior dash, are hot, the fluids you use to clean will dry out quickly which makes the detailing process quite difficult. Either do it in the shade or wait for a cool day. 1 – If your car has leather seats, apply a good conditioner to them. Take your time and work your conditioner into all the seat stitching and cracks, if they exist. 2 – Wipe down the hard interior surfaces with a mild all-purpose cleaner. Then, use an interior dressing like Armor All to give the surfaces a shine. This step makes an instrument panel and dash look great. 3 – Clean your windows and mirrors with a good spray-on cleaner. A trick of a professional detailer is to use single-edge razor blades and four-ought steel wool to clean off any gross stuff on the glass. 4 – Clean your wheel rims with a a wheel cleaner or degreaser and a wheel brush. 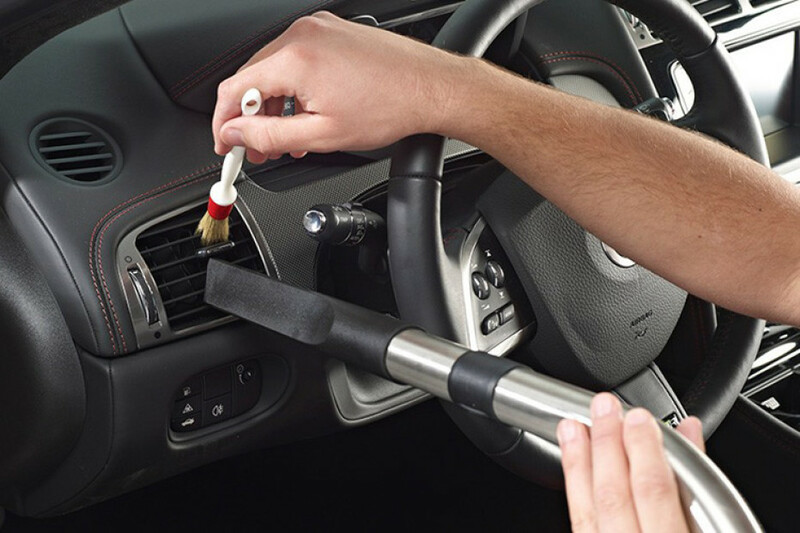 Allow the wheel cleaner product to penetrate wheel rims for thirty seconds to one minute before you brush. After cleaning, you can apply a metal polish or special wheel surface enhancer to give your wheels a polished-look. 5 – Vacuum all your floor mats and the upholstery. Be sure that you use a narrow vacuum nozzle to get into all the seat cushion cracks and in between the seats. If there are stains or ground in dirt on the seats or carpets, apply a foam cleanser and rub it into the needed areas. After soaking for about five minutes, blot the moisture up with a dry cloth and let dry. 6 – Wash your tires with whitewall tire cleaner, then apply tire dressing to get a fantastic glossy look. This is what the Service Manager at West Valley, a full-service Chrysler and Jeep car dealer in Canoga Park, CA, recommends! 7 – Spray degreaser on your engine and similar components, then let sit for 15-20 minutes. Then wash off with a pressure washer or garden hose. 8 – Wash your vehicle’s exterior with a car washing soap, not a dishwashing soap. Dishwashing soaps will be too harsh for modern day car paint jobs so they need to be avoided. Also, use a deep-pile terrycloth towel which will trap contaminants so they will not grind into the car’s paint surface. 9 – Apply a wax or polish by hand or orbital buffer. Follow the instructions on the wax or polish container.